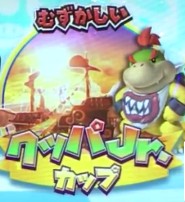 The Bowser Junior Cup's logo in Mario Kart Arcade GP DX. The Bowser Junior Cup is a Cup that appears in the game Mario Kart Arcade GP DX. It is the fourth out of the six cups in the game. It also appears to be a follow-up to the fifth cup, the Bowser Cup. Its courses are based off of the cloud worlds from the New Super Mario Bros. series. Its courses also contain a few references to the Super Mario Galaxy series, which both games contained a lot of Airships, which are commonly found in the Bowser Junior Cup. This page was last edited on January 23, 2018, at 20:12.